Castrol Brake Fluid Dot 4 Brake Fluid is formulated from mixed polyalkylene glycol ethers together with carefully selected additives. While topping up the oil at that frequency may be annoying and possibly expensive, there is generally nothing to worry about. The wind in your hair! The roar of the engine! That's what cars are all about right?. With a wide range of oils and speciality care products Castrol are on hand to help keep your car and its engine in the best condition possible. Castrol RR363 brake fluid. Castrol RR363 hydraulic fluid. It is also suitable for use in place of Castrol LHS2 in the hydraulic systems of pre-1966 Citroen models fitted with a black reservoir. Castrol RR 363 is also known as. Castrol Brake Fluid Dot 4 Brake Fluid is formulated from mixed polyalkylene glycol ethers together with carefully selected additives. Quantity: 2 Litres. This is to ensure our prices remain as competitive as possible. Castrol Brake Fluid Dot 4 Brake Fluid is formulated from mixed polyalkylene glycol ethers together with carefully selected additives. Quantity: 1.5 Litres. This is to ensure our prices remain as competitive as possible. Castrol Brake Fluid Dot 4 Brake Fluid is formulated from mixed polyalkylene glycol ethers together with carefully selected additives. This is to ensure our prices remain as competitive as possible. While topping up the oil at that frequency may be annoying and possibly expensive, there is generally nothing to worry about. Brakes are essential for any car as it is not possible to stop without them. Castrol’s brake fluid range includes products for high performance cars, driving under demanding conditions, to products with increased safety margin. Castrol Brake Fluid Dot 4 Brake Fluid is formulated from mixed polyalkylene glycol ethers together with carefully selected additives. Quantity: 3 Litres. This is to ensure our prices remain as competitive as possible. Part Manufacturer:CASTROL CASTROL BRAKE FLUID 0,5L. BRAKE FLUID. The faster, safer way to send money. Part Manufacturer:CASTROL MOTO SILICON SPRAY. The faster, safer way to send money. Part Manufacturer:CASTROL MOTO CHAIN SPRAY OR 0,4L. 0.4L synt. white chain lubricant. (for O-ring and X-ring) CASTROL. The faster, safer way to send money. FMVSS116 DOT4. This product has been formulated from mixed polyalkylene glycol ethers and borate ester together with other high performance additives and inhibitors which give ultimate system protection against the effects of corrosion and high temperature vapour lock. Part Manufacturer:CASTROL MOTO CHAIN LUBE RACING 0,4L. 0.4L synt. white chain lubricant. The faster, safer way to send money. Part Manufacturer:CASTROL MOTO GREENTEC BIKE CLEANER 1L. 1L Detergent cleaning of motorcycles (removes dirt, oil, lubricants) CASTROL. The faster, safer way to send money. 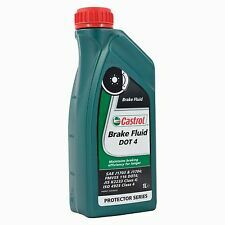 Brake fluid DOT4 (1L) CASTROL DOT 4. Part Manufacturer:CASTROL CASTROL BRAKE FLUID 1L. The faster, safer way to send money. This is part is manufactured by CASTROL. This product has been formulated from mixed polyalkylene glycol ethers and borate esters together with other high performance additives and inhibitors which give ultimate system protection against the effects of corrosion and high temperature vapour lock. This is for ONE bottle of mineral oil that goes into Rolls Royce Bentley and Jaguars that have the green mineral oil label. Let us know if you want u to check the correct application. MOLLE A GAS. EAN Does Not Apply. Via Dei Romani 6/8. WORLD AUTO PARTS. WEAR DETECTORS. Right of Withdrawal. CLUTCH KIT. Conform to the original. MOLLE A GAS. EAN Does Not Apply. WORLD AUTO PARTS. WEAR DETECTORS. Right of Withdrawal. CLUTCH KIT. Conform to the original. about 2-3 gg. MOLLE A GAS. EAN Does Not Apply. 81055 s. Maria C.V. (CE)-Italy. Via Dei Romani 6/8. WORLD AUTO PARTS. WEAR DETECTORS. Right of Withdrawal. CLUTCH KIT. Model: 15036B. Item model number: 15036B. Manufacturer Part Number: 15036B. Genuine Castrol lubricants for your engine - Protection of your car. Why Buy From BirdOnAWire?. Genuine Castrol lubricants for your engine - Protection of your car. Safety data sheet available on request. Castrol Brake fluid Dot 4. Castrol Brake Fluid Dot 4 Brake Fluid is formulated from mixed polyalkylene glycol ethers together with carefully selected additives. It’s a high boiling point brake fluid formulated from mixed polyalkylene glycol ethers and borate ester with other high performance additives and inhibitors.